I was reading one of my favorite kill-time-with-funny blogs, Passive Aggressive Notes, today when I came across this post. For those not familiar with the blog, readers from all around can submit notes and other examples of passive aggressive (or just aggressive)-ness in action so that everyone can laugh at someone’s petty tyrancy. After the giggles had faded out, I couldn’t stop thinking about this one’s message: “If you can’t cook, don’t try.” I wonder how many people have thought this about someone else’s cooking but were too polite to say it. 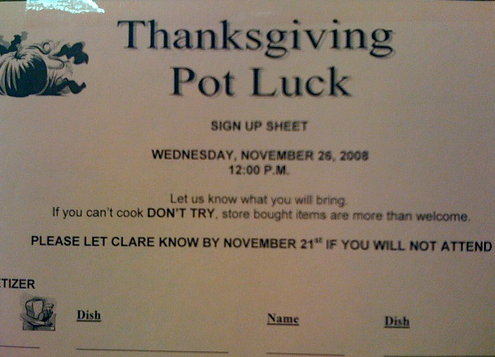 I also wonder what horrible past potluck experiences has led this poor host to such austerity. Perhaps you could provide some insight to that question, with your most hilariously awful potluck food photos. So, let’s bring cameras to our gatherings, snap photos of the not-so-delicacies, and scare Clare together! (Presuming that’s the name of this rather unencouraging author of the note.) Please send me a snapshot of a potluck dish (can be your own or someone else’s) and include in your email the Name of the Dish and Why it Was Scary in no more than a couple sentences, please. Send it to me by January 2, 2009 and please type in the subject line of your email Scare Clare. I’ll post a round-up shortly after! It’s time to say bring the chips, please. Pick up a bag of ice along the way if you could. BYOB is practically a given, unless you don’t want to partake in what shreds of merriment this season can still reign in. i am very crazy to see it awesome remote desktop which allow me to connect or access another computer through my computer. Thanks a lot for visit this support of remote desktop.